At TeeJet Technologies their single focus is on application technology. The company and their products have been part of agricultural applications since the first crop protection products came onto the market in the 1940's. Their control systems date back to some of the earliest in-field uses of electronics in agriculture. This experience in the fields of spraying, fertilizing, and seeding means nobody is better suited to provide quality products and technical solutions for your business. Delta Precision Systems is your trusted Dealer and Installer of TeeJet Technologies. Contact us today to get started. TeeJet has been an innovator in agricultural application technology for more than 70 years. During that time, they've continuously built on their reputation for offering the highest quality products, the latest technology and the widest array of choices to from VR (Variable Rate) Nozzles to Application Control and GPS Guidance Systems . Click the links on the side to discover how TeeJet products can help you work at peak efficiency and maximize yields and profits. 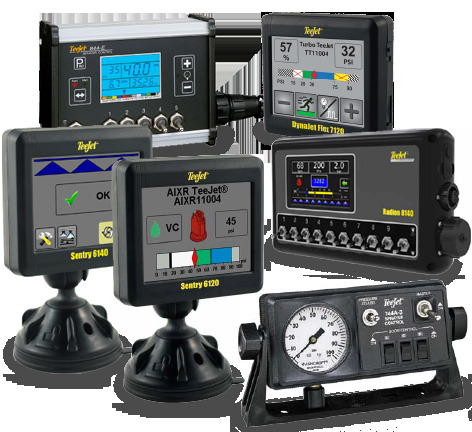 For your equipment to operate at peak efficiency, you have to be able to monitor it minute by minute. TeeJet's solutions enable you to exert maximum control over how, and how much, coverage you're applying, even as conditions and vehicle speeds change.